Without giving away any spoilers, the play follows Christopher Boone, a 15 year old boy who begins investigating a mysterious crime, against the wishes of his father. As his investigation takes him further and further away from his comfort zone, Christopher begins to unravel an even bigger mystery, which will change his whole life. Honestly, I was gripped from start to finish. The book is honest, touching and full of twists and turns which will definitely keep you on your toes. The moment you think you know what’s going to happen next, the plot will take another sharp turn and you’ll be just as enthralled as you were before. For me, though, it was the impressive movement pieces which really gave The Curious Incident[…] the wow factor! I am a huge fan of the work of Frantic Assembly and as usual their choreography was breathtakingly daring. A particular standout scene for me was a scene in which physical theatre was used to bring the mad hustle and bustle of the London Underground to vivid life. This, combined with amazing visual effects, a top class set (Bunny Christie strikes again!) and interesting lighting and sound design made The Curious Incident[…] a visual treat unlike any I’ve seen in a long while. I was thoroughly wowed! The cast were also brilliant, and I particularly enjoyed the emotionally charged and incredibly poignant relationship between Christopher (Joshua Jenkins) and his father (Stuart Laing). Their relationship was totally believable and I really rooted for them both throughout. As soon as I left the theatre, I was wanted to book myself another ticket and see the show again. I 'd laughed and cried in equal measure (and had also done that thing where something is just so adorable that you laugh and then it turns into a sob and you’re crying before you even realise what’s happening!) and the emotional payoff at the end was well worth the wait. 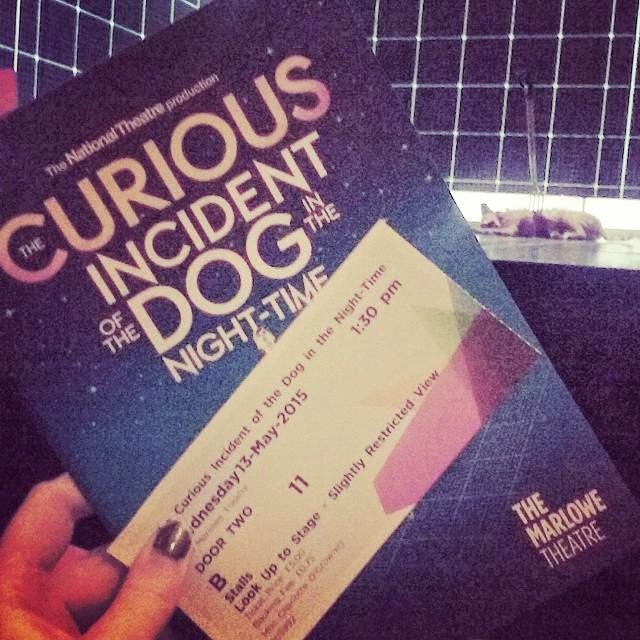 I may very well be one of the only people who hadn’t seen The Curious Incident[…] until now, but if you’ve somehow managed to ignore the hype as well I recommend that you overlook it no more. It’s an affecting piece of theatre which NEEDS to be seen!